The film industry is changing tremendously. With streaming technologies taking a stronghold on the market, the filmmaker is put at an extreme disadvantage. The streaming stronghold has become the streaming stranglehold. What happened to musicians a few years back with the advent of iTunes is now happening to filmmakers. People can get access to content in more places more easily than ever before. More bandwidth equals more streaming movies every single day. Simultaneously, consumers are looking for the best possible deal on their entertainment. So, a monthly subscription to streaming services like Netflix has huge advantages to the consumer. Unfortunately, the consumer’s advantage is the filmmaker’s disadvantage. The idea of paying one low monthly fee for as many movies as you’d like to watch is extremely appealing, but it’s not without its repercussions. And the independent filmmaker is the one takes the brunt of it. Think about it for a moment–if you pay $7.99 a month and in that month you consume 10 movies, that means you paid 79¢ for each film you enjoyed. How much of that money do you actually think ends up back in the hands of the filmmaker? Netflix spends a lot of it’s money on deals with large studios to secure big name pictures with big name actors. The independent filmmaker on the other hand is typically not getting the big dollar deal. Their payment is much more conservative and is often delivered as one single upfront payment. For those who may not know, the independent filmmaker is not in a position to work directly with Netflix — they must go through an aggregator in order to secure a spot on the Netflix roster. This means that the small, meager payment actually goes directly to the distributor or aggregator, before it’s split with the filmmaker. Each filmmaker has a different deal with their distributor but the percentage that the filmmaker receives can often be the smaller portion of the split. So let’s talk specifics about a few deals in which I’ve been involved. The first distribution deal that I signed for my film Rebellion of Thought was structured like this: 80% to the distributor and 20% to me as the filmmaker. This deal was for traditional media in box stores as well as online sales. The film had a retail price of $22.95, but let’s just use $20 for this example. When the retailer received $20 for the DVD, he had already purchased the DVD from the distributor at whatever agreed upon price. Let’s say $10, which is often the case, unless a deeper discount was applied from the wholesaler. With our example the DVD sells for $20 to the consumer, giving $10 to the retailer and $10 to the distributor, then as the filmmaker I’d receive my 20%, or two dollars. The distributor gets the lion’s share of the money because they are doing the duplication of the film as well as the marketing for the placement of the product. So, if someone buys a film at a traditional retailer for $20, the filmmaker can end up with as little as two dollars. You can see how an independent filmmaker needs to sell a lot of movies in order to make a living doing what he’s attempting to do. Now lets look at streaming. The cost to prepare a film for streaming media platforms is much less than the cost of DVD replication. A single file of the film is made and it is converted into whatever format the distribution platform needs and typically delivered on hard drive or via upload. There are no replication costs like you would have for traditional media. So this can be advantageous to the filmmaker, because the lower the cost for the distributor, the higher the percentage the filmmaker may be able to secure on a streaming deal. So, for example, on one of my recent films our deal looked like this. 40% for the distributor and 60% for me, the filmmaker. Now, with streaming I’m able to end up with more of the received money than I ever was able to with DVD distribution, but it’s not not all so rosy when you look at the various streaming platforms. My current distributor shies away from platforms like Netflix that only offer one time payments because it can be a disadvantage to the filmmaker in the long run. Instead, he opts for platforms such as Amazon Instant, Vudu, Vimeo On Demand, Google Play, etc. These services are pay-to-play options where the consumer has to pay specifically for the films they want to watch. This means that each time someone rents or purchases a digital copy from one of these services, the filmmaker benefits. Now let’s address physical DVD’s, a form of media that, since the closing of your local Blockbuster, have been on the steady decline. A packaged DVD of my current film costs approximately three dollars per disc plus advertising and marketing costs. On a side note, each copy of this DVD contains a 48-page full-color study guide, which is why it costs twice as much as your typical DVD to create… oh, and these costs do not include the cost of writing, layout, design, artwork, or programming the disc and support materials. This brings us back to the importance of the DVD and of buying your copy directly from the filmmaker. Let’s go back to our earlier example of a $20 DVD purchase. Let’s say that you buy that same $20 DVD directly from me the filmmaker. I don’t receive all of that money, because I had to invest in the replication of the DVD media and the advertising of the product. With my current film the DVD contains 48 page full-color study guide companion to the film. So, my costs to create The DVD package are approximately three dollars per disc plus advertising. As you can see, I as a filmmaker receive a much larger portion of the money when you buy the DVD directly from me. Another long-term benefit of the physical DVD or Blu-ray is that it advertises itself. Simply put, it exists in tangible form. The disc may sit on a shelf, but in doing so, it’s always there to remind you of the film, to encourage you to watch it again, to be shared with another person, to help extend the life and awareness of the film. You can’t do this with a stream of a film. Sure, you can purchase a download of a film, but it sits hidden on a hard drive somewhere and certainly doesn’t advertise itself in the way traditional media does. I’m encouraged to see big box stores beginning to sell movies on Ultra HD Blu-ray. This gives hope to the future of disc-based media. As long as content can be created at a higher resolution than the bandwidth your average home internet connection can allow, there may be hope for films on disc. Much of these same economics apply to musicians, painters, authors, etc.—any artist who makes a product and sells it. 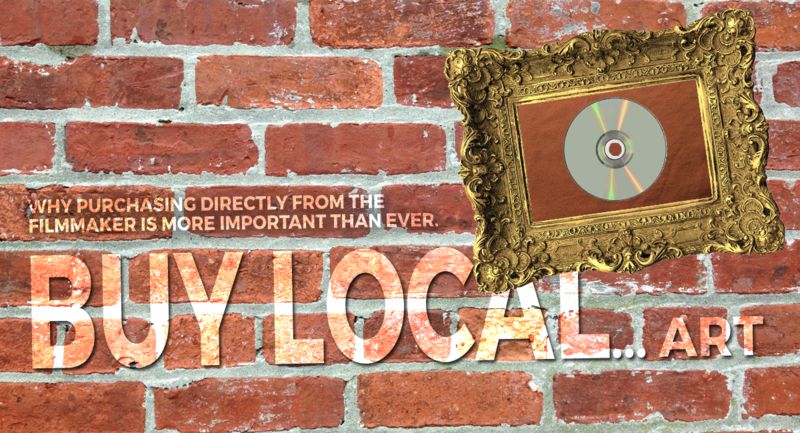 With so much attention being placed on “buy local” I would like to add to that: “by local art”. And of course with the Internet you don’t have to be local to purchase films from an independent filmmaker. You can go directly to most any indy filmmakers website and purchase their films, whether on DVD or through streaming. When you do this you encourage us far more than you will ever imagine. Every time an order comes through our website, it gives us reason to celebrate. It encourages us to continue pursuing these arts. And it helps us feed our families. So please… buy local art. If you are interested in buying a physical, tangible, old school DVD of any of my films directly from me, they are available online at Big Heaven Cafe.